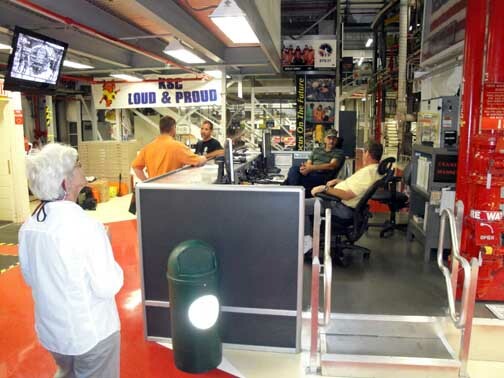 Media visits to the Discovery on June 21, 2011, were not a crowded event. Media went onto Discovery's decks two at a time and had fifteen minutes or more to root around and explore. Carol Anne Swagler of The Grove Sun and Seine/Harbour® Productions is on the far right. About these 19 Photos. 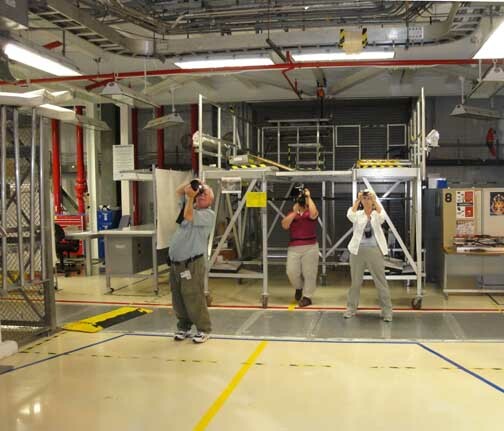 On June 21, 2011, NASA invited about 85 members of the media to Florida to visit the Shuttle Discovery, now in High Bay Number 1 of the Orbiter Processing Facility (OPF) (OPF= hangar). Each member of the media was assigned a one hour slot, and given 15 minutes on the decks, crawlways and bay inside the Discovery where a member of the Flow Team was available. 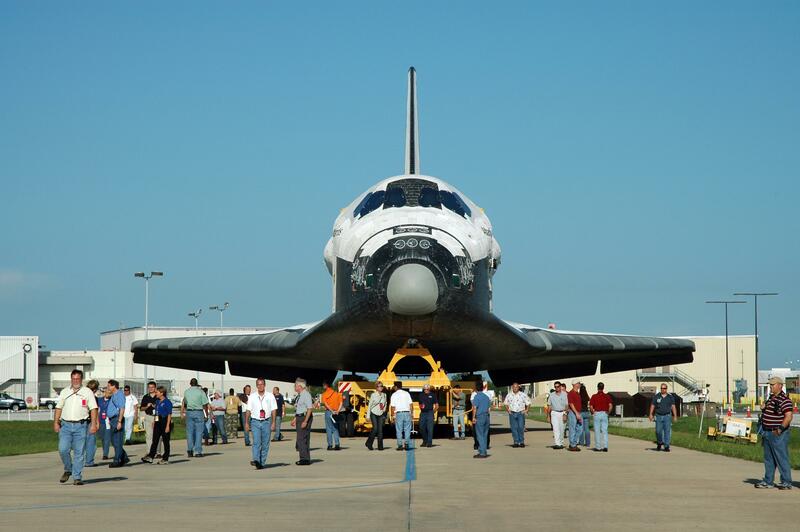 This was the second, and probably last time, general media will visit the Discovery before she goes to the Smithsonian Museum at Dulles International Airport early in 2012. 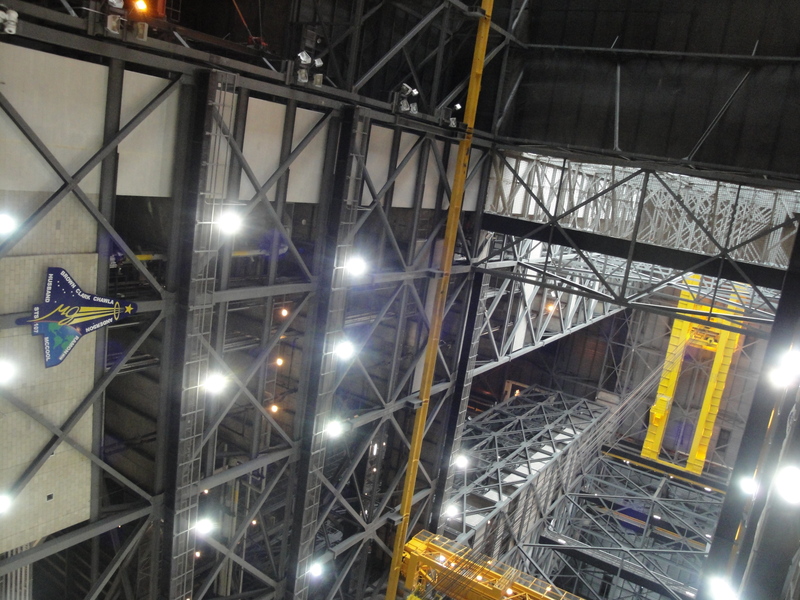 In April, NASA also allowed selected members of the media into High Bay 1. At that time the dismantling of the Discovery’s recoverable parts and removal of hazmat materials, now well progressed, had not begun. The Flight Deck of the Shuttle Discovery. The formal name of the Discovery, the oldest survivor in the fleet, is “OV-103”. This stands for “Orbiter Vehicle, Number 3”. 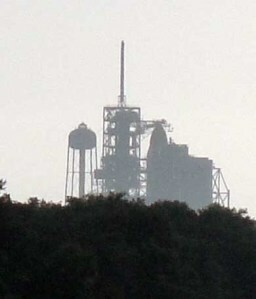 In all five operational orbiters were built. 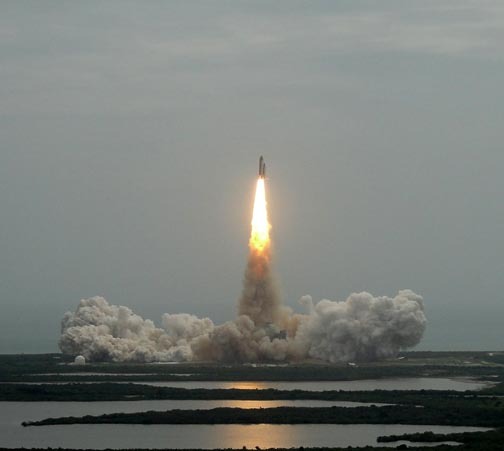 In order they were Columbia (lost over Texas), Challenger (lost on liftoff), Discovery, Atlantis and Endeavour. Only the latter three orbiters survive. The photos below were taken either by Peter Michael Crow or by Carol Anne Swagler on June 21, 2011 at Kennedy Space Center, Florida. 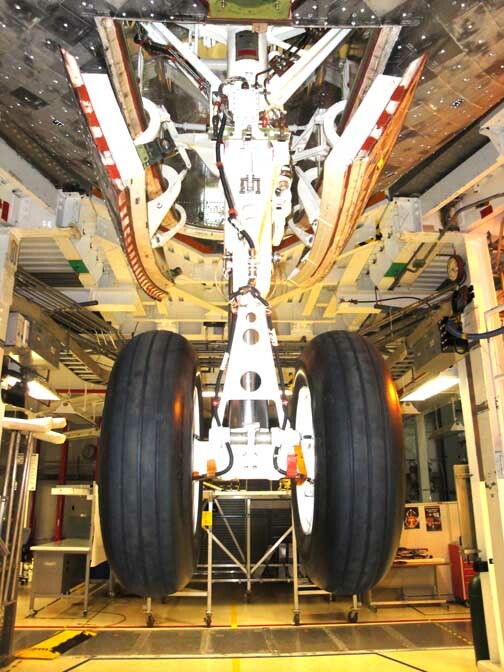 The nose wheel of the Discovery. The landing gear of the shuttle is dropped only seconds before touchdown because once the gear is dropped whatever lift the shuttle has, which is very little, is gone. 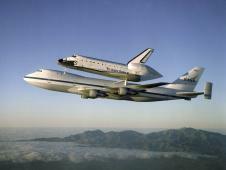 Rightly, descent of the shuttle to landing is akin to watching a rock fall out of the sky. 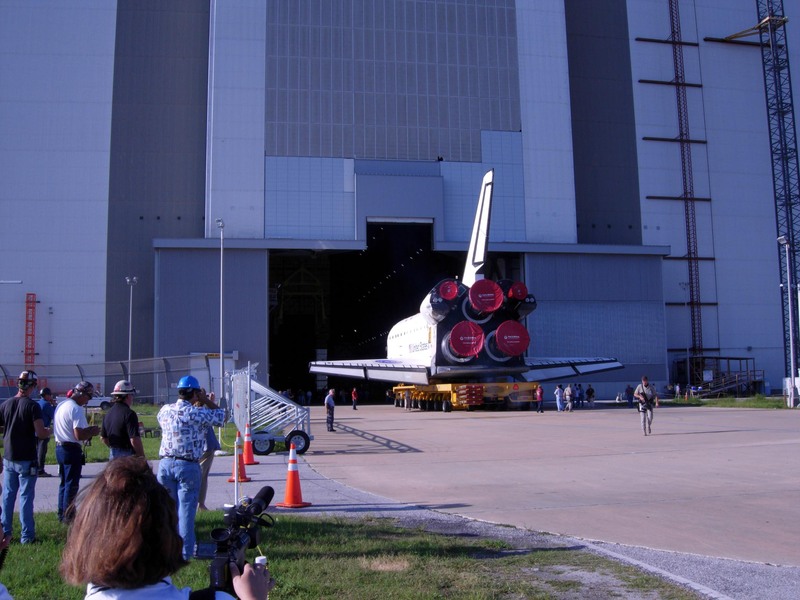 This photo is taken from under the shuttle looking toward the front. 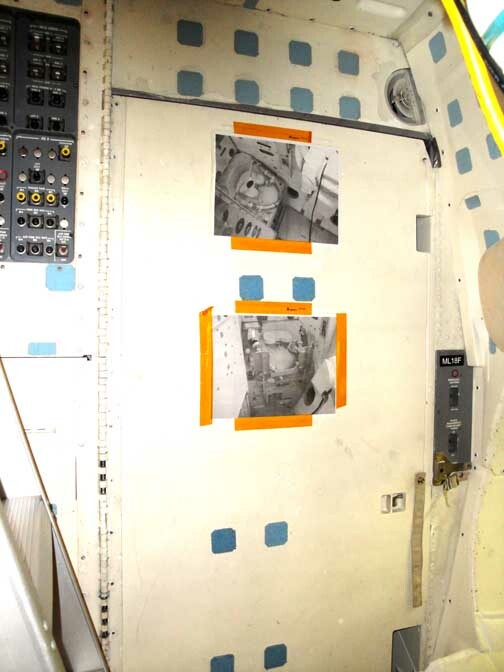 The insulating heat tiles are directly above, and above that, the crew compartment. Flight deck on the Discovery, and the Commander's lefthand seat. 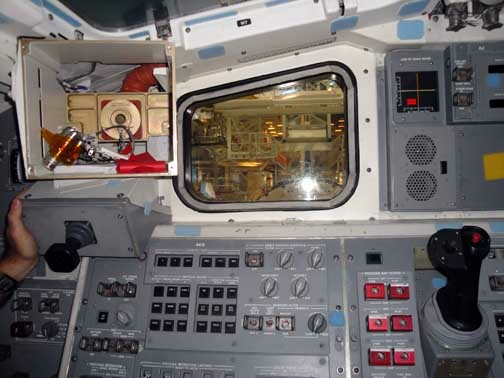 The windows were covered and therefore it was dark inside the flight deck and crew compartment. The five seats in the crew compartment had already been removed. The console to the right of the Commander. 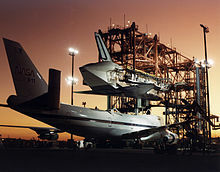 To command a shuttle, you must first ride in the second seat on a mission and spend a year or more training on the ground. 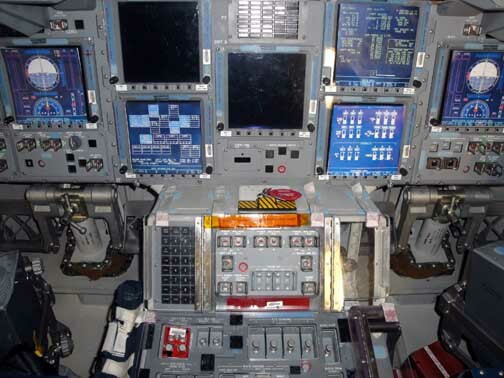 To dock at the International Space Station (ISS), the commander gets out of his seat, turns around 180-degrees and, facing the orbiter bay and air lock, uses only two controls (shown below) to ease the shuttle to docking devises on the ISS. 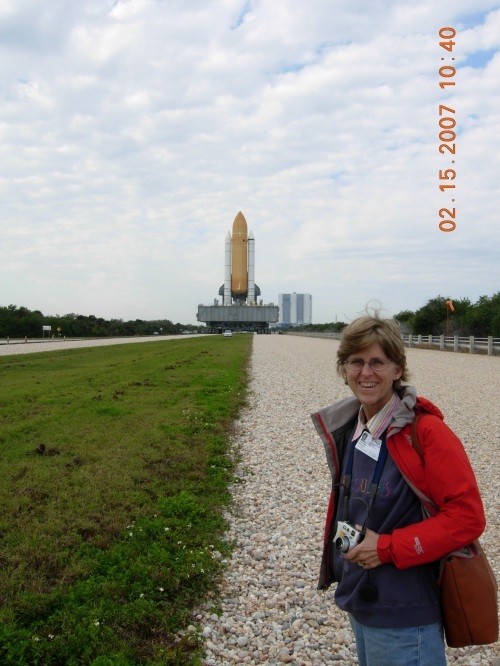 Carol Anne Swagler on flight deck of the Shuttle Discovery. Ms. Swagler shot both video and still photographs. 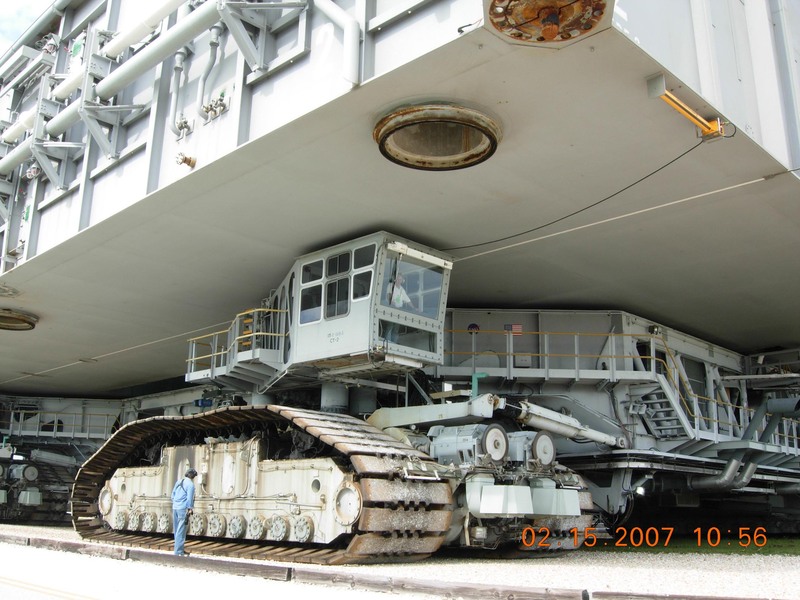 Others had suggested, correctly, that flash would be needed on the shuttle decks. 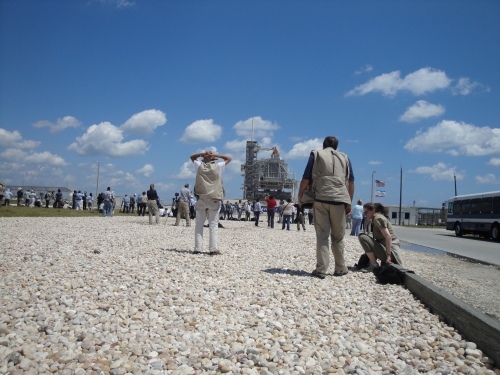 The schedule became more complicated as the day went on when two foreign wire service photographers showed up and pressured KSC public affairs staff (successfully) to be allowed onto the Discovery. Others also tried to squeeze additional members of their staffs into the tight schedule. There are two windows on the flight deck looking directly into the orbiter bay. 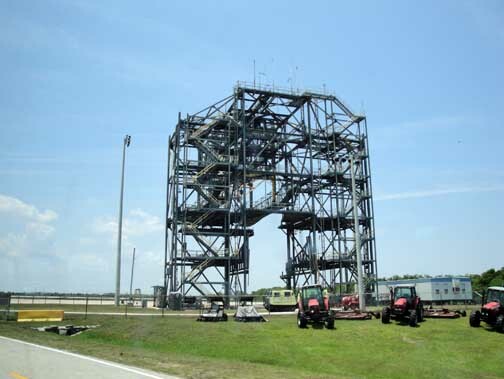 In the forward end of the bay is the hatch where the shuttle docks with the ISS, and where astronauts have ingress and egress from the ISS and the shuttle by crawling through a small crawlway (shown below). 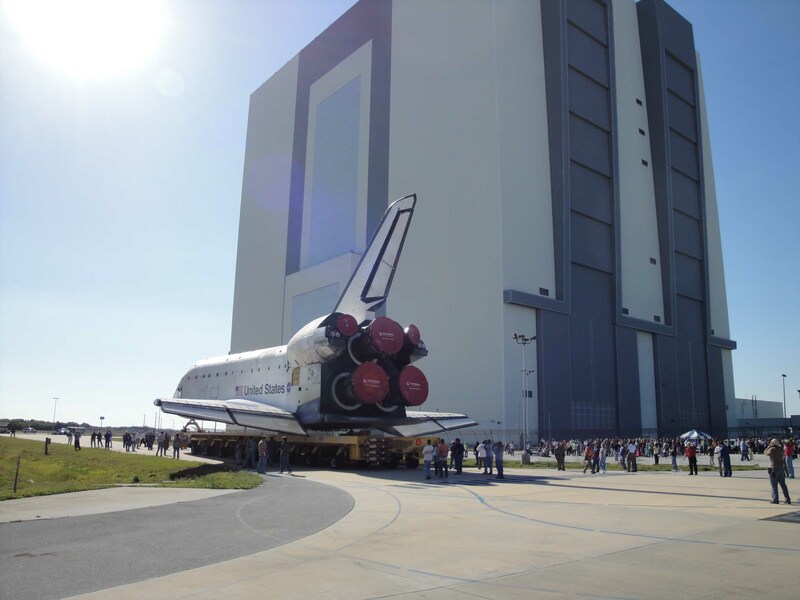 To dock, the shuttle commander stands here, gazing out the left window. One of the two controls he uses to dock is shown -- it is the block handle just to the right of the lefthandside window. Both docking controls are shown in the next photograph. Both docking controls -- there are only two -- are shown here. 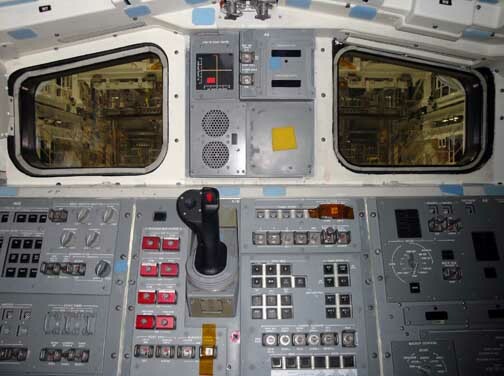 The left hand docking control, the black knob to the left and just below the window, is smaller than the larger black handle to the right and below the window. Both levers are roughly on the same level. Just call me if you still can't find them. The shuttle commander docks by looking out this window. It takes the shuttle roughly two days after liftoff at Kennedy Space Center to catch up with and dock with the ISS about 200 miles above the Earth. The shuttle and the ISS orbit at about 18,000 miles an hour which takes 88-90 minutes per orbit. 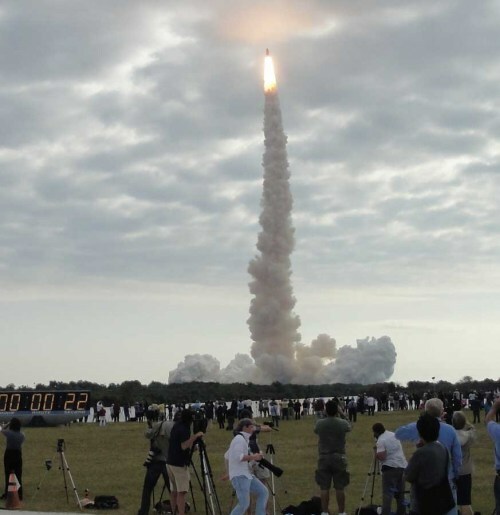 To land in Florida, the shuttle undocks and then does a de-orbit burn commonly over India or between India and Australia on the other side of the world. 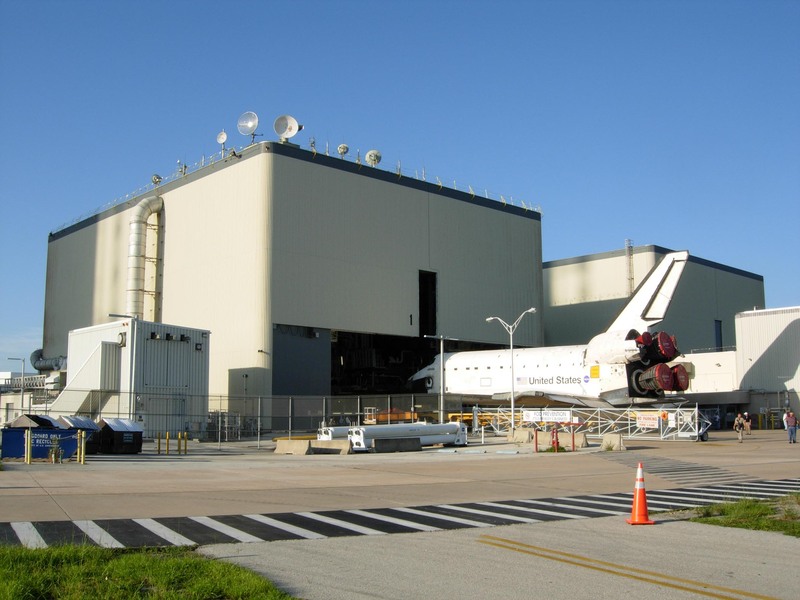 Once that de-orbit burn takes place the shuttle has no where else to go except KSC -- she is coming to the SLF at KSC. For the next 60 minutes the shuttle descends slowing, circling half of the world. Her speed declines from 18,000 mph to about 200 mph on landing. 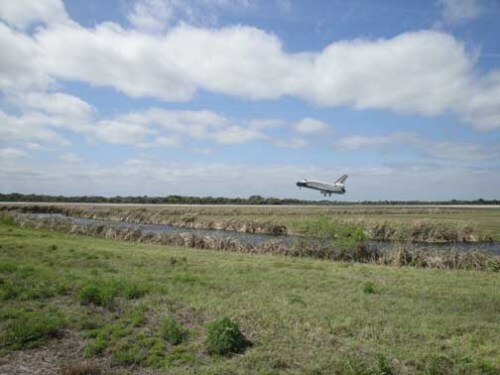 Pete has witnessed many landings in Florida and in California and says, "it never gets old; it gets me every time." The crawlway from the crew compartment to the orbiter bay and hatch. This is the crawlway crew uses to ingress and egress the ISS. This is Pete in the crawlway. Crawling is the only way to traverse it. 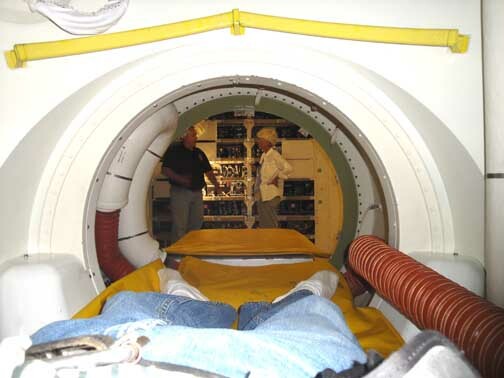 Pete's jeans, belt buckle (lower left) and his feet wearing special booties suppied by NASA are visible. The view is toward the front of the shuttle. 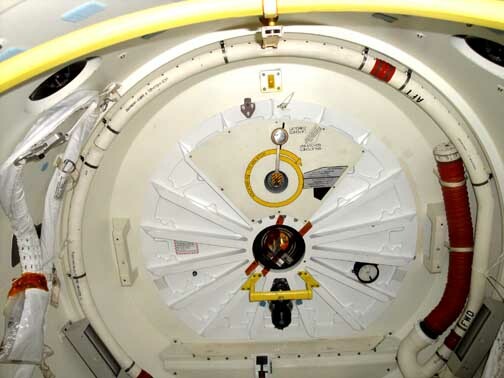 Directly above Pete is the hatch that docks with the ISS. Behind him is the orbiter bay -- his head actually is partly in the bay at this moment. The controls to open and close the hatch (photo below) are on his left and right. In the background in the crew compartment Carol Anne confers with a NASA Flow staff member in the Crew Compartment. 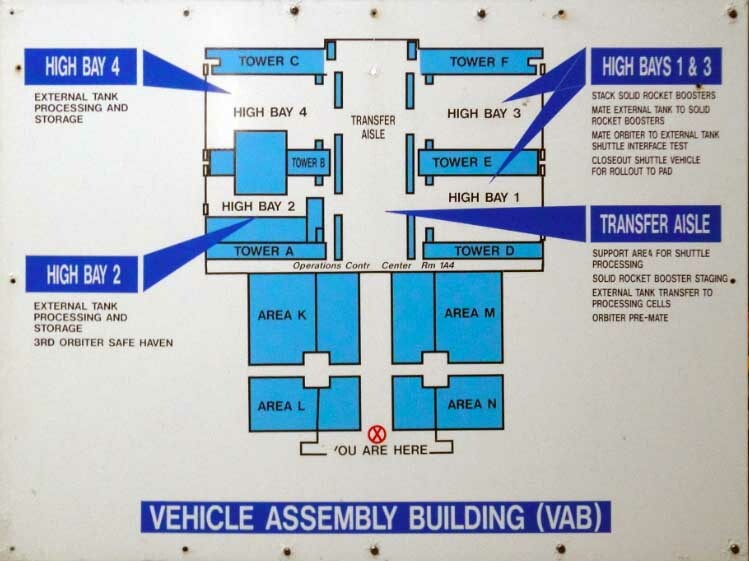 The Flight Deck is the upper compartment; the crew compartment, the second of two shuttle decks, is directly below the flight deck. Entering the shuttle through a main hatch, you are on the Crew Deck. 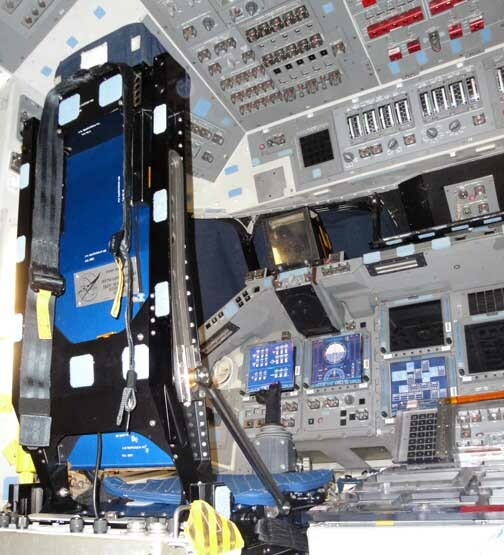 Access to the crawlway and the separate small ISS hatch is also located on the crew deck. 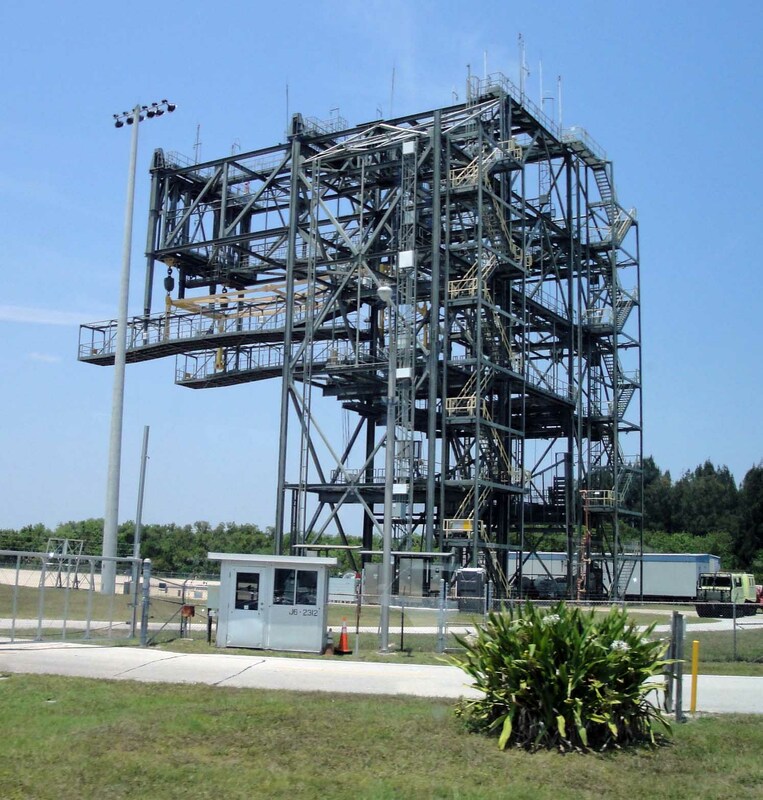 To get to the flight deck you climb up a narrow ladder. 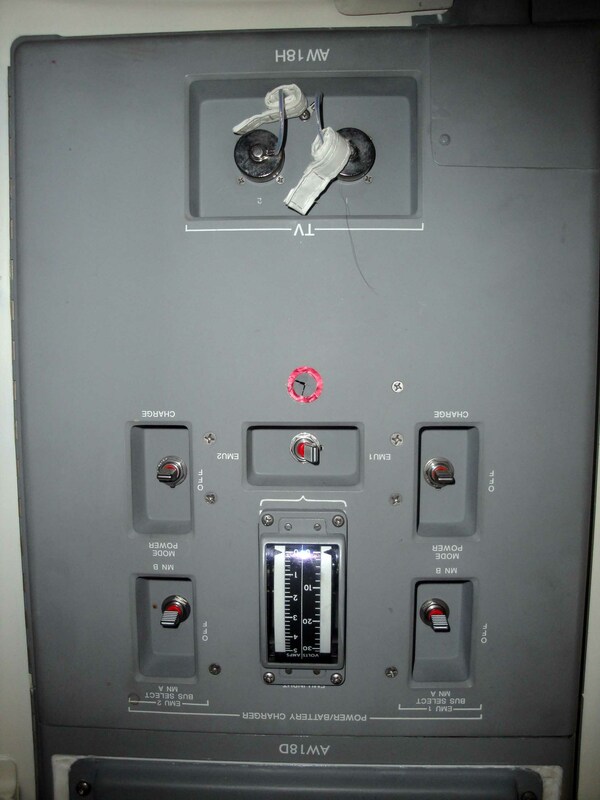 ISS Docking/Hatch Controls -- used to open and close the hatch to the ISS. When Pete asked "what question do you wish someone would ask," a NASA tech replied "no one asks why the control to open the ISS hatch are upsidedown." So Pete asked and the guy told him, and now Pete has forgotten. Actually it has to do with how astronauts are lying when opening and closing the hatch. To us it looks like this photograph is upsidedown. 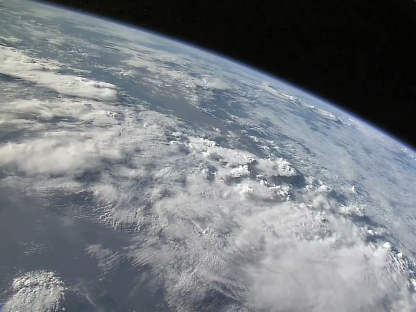 To an astronaut in space, it looks just fine. This is the hatch to get to and from the ISS. 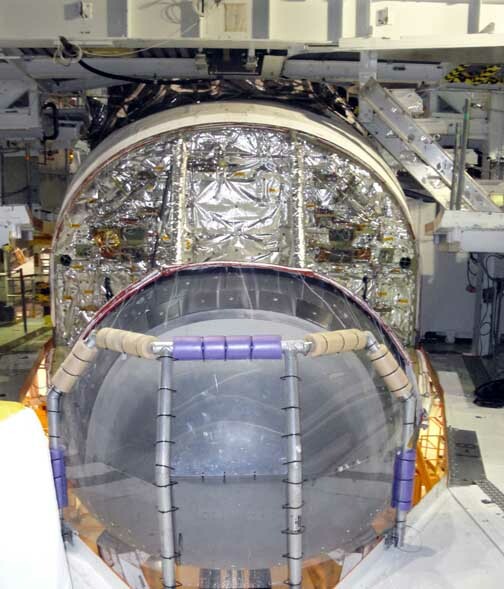 The shuttle and the ISS docking devices are located just outside this hatch. To see the other wide of this hatch from the orbiter's bay, scroll down. 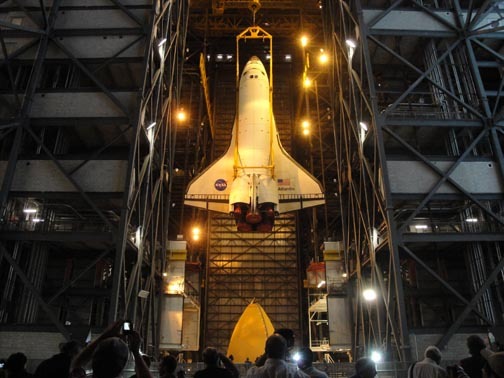 The hatch is located toward the front of the shuttle and is accessed through a small crawlway. Orientation of this photo is toward top of the shuttle. 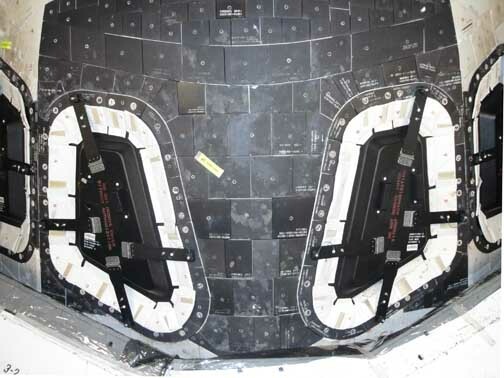 The bottom of the shuttle with its insulating tile is directly opposite. This photo is taken by lying in the crawlway between the crew compartment and the orbiter's bay. The most common question crew and visitors alike ask is "where the bathroom?" 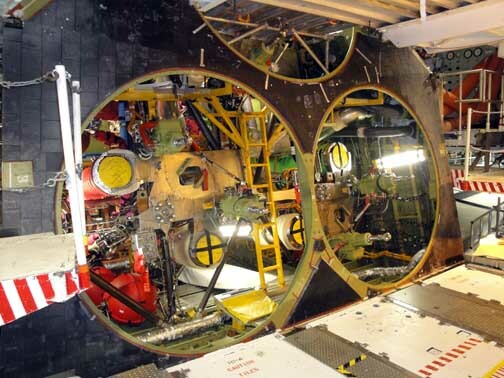 Here's it is, just beyond this door on the crew deck adjacent to the main entrance hatch and to the right of the crawlway to the docking/ISS hatch. Got it? Now go use the restroom out in the hangar, second door on the left. The main desk at High Bay 1, OPF. There's nothing simple about servicing the orbiters. Every seven flights they had to be returned to Palmdale where they were manufactured and torn apart. The orbiters as built were extensively updated over their lives. Built to fly at least 100 times, none of the fleet of five flew anywhere near that number of flights. With only 135 flights for the entire fleet, the orbiters are being sent to museums with a lot of life left in them. What did in the program? The cost, and a lack of public interest. When President Barrack Obama visited Kennedy in April he and his family looked bored and stood around while being briefed with their arms folded and often were looking somewhere else. 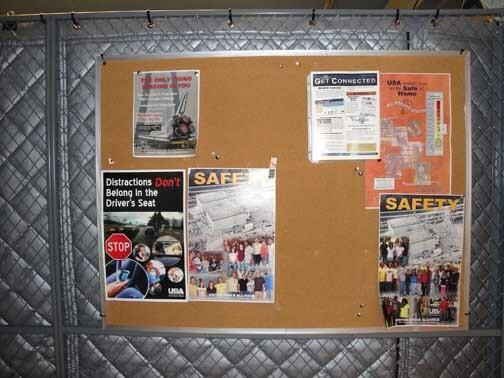 Safety signs are everywhere at Kennedy Space Center. No rings, keys, cellphones or anything in your pockets above the waist are allowed in the OPF. NASA was in the past in the business of doing the impossible. When President John Kennedy declared the US was going to the Moon in 1961, no one knew how to get there. When the US Air Force wanted an invisible plane, no one had any idea how to do it. This is what science does -- get a mission, get the money and then everybody stand back. Soon you're on the Moon. Soon you've got a plane invisible to radar. Current NASA officals, and perhaps Mr. Obama himself, apparently do not understand what science does or how it operates. 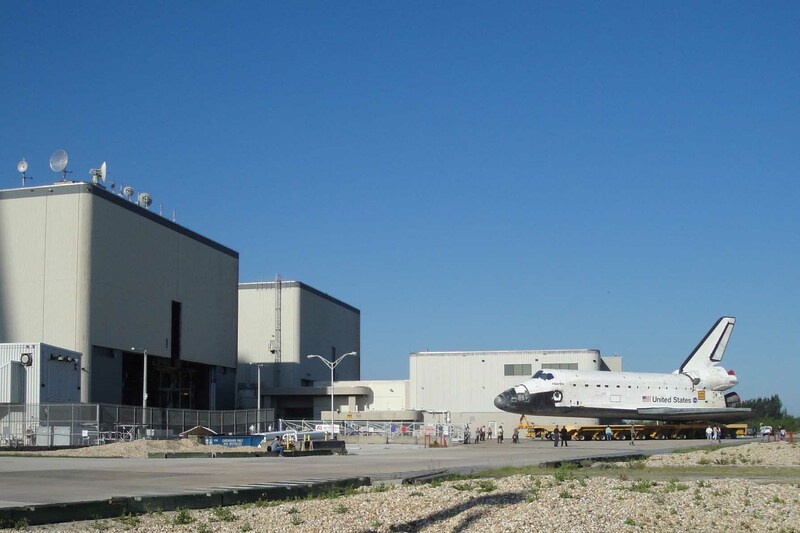 When the second highest NASA offical spoke to Tweeters at KSC last year she declared that the Obama administration had canceled Constellation, the shuttle replacement, "because it doesn't work." The Tweeters, far more sophisticated than she imagined hooted and began yelling at her and she fled. Constellation was soon re-instated, but then killed again. Shuttle close-ups: A Nose you cannot help but love. 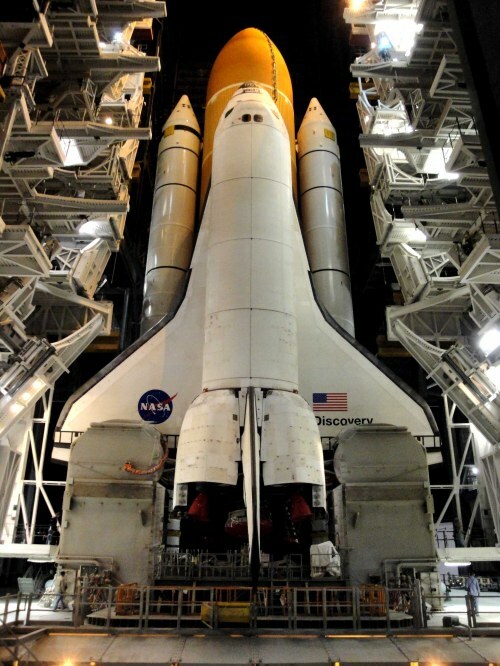 This is the front nose of the shuttle. The cockpit/flight deck windows (shown below), not really visible in this picture. The windows are not behind the silver covering -- that is an optical illusion. The flight deck windows are at the top of this photograph, just below the white beam. Shuttle close-ups: Flight decks window, looking directly down. There are four front facing windows. 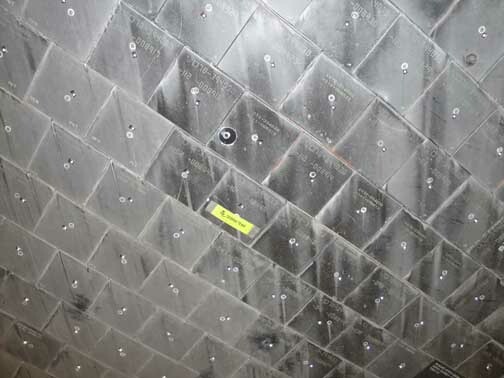 Shuttle close-ups: Insulating tiles on the bottom of the shuttle. The hole in the middle of each tile is to check whether moisture has gotten in behind the tiles. The tiles are bonded to the shuttle, but the tiles will absorb great amounts of water if the seal is breached. This would endanger the shuttle. After landing every tile was carefully checked before the shuttle was sent into space again. 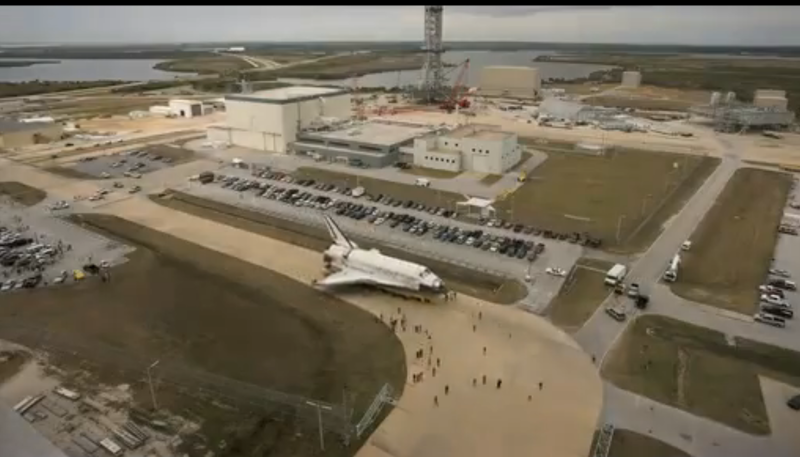 NASA has been removing everything from the shuttle that might be of later use. 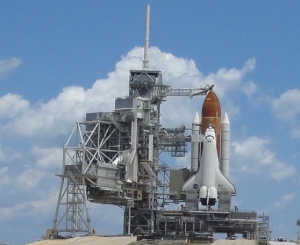 The cost of purchasing engines for a later space project, for example, can be saved if the shuttle engines are moved and stored. In April when we visited the OPF the Discovery engines were still in place. Now, shown in this photo, they have been removed and stored. Mockups matching exactly the appearance of the engines and other parts will be on the shuttle when she arrives in Washington, DC, at the Smithsonian in early 2012. Discovery will look the same -- but she will not be. This is a mild point of contention between NASA and the Smithsonian. 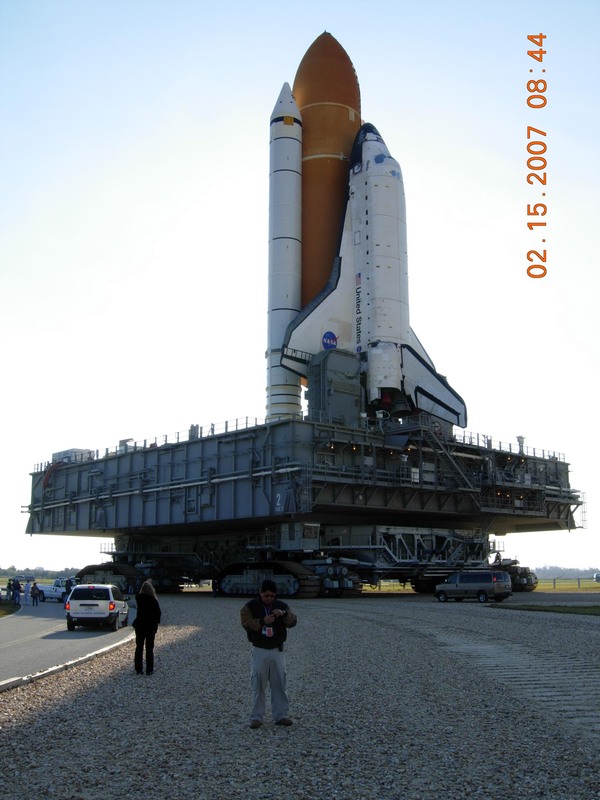 The Smithsonian argues that by having a complete shuttle, exactly as flown, the shuttle will be available for later study. But that is not to be -- budget constraints and worries about availability of money for future space projects has made NASA wary and protective of what it has. 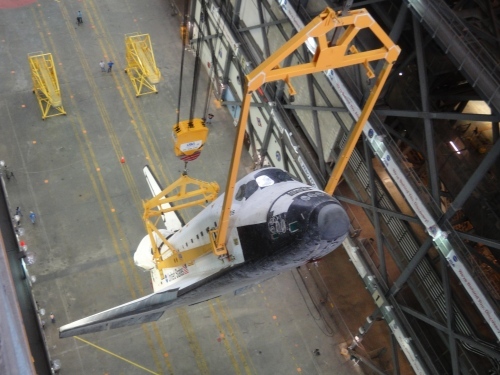 NASA is keeping the shuttle engines and other parts. The Smithsonian gets painted plywood. Shuttle close-ups: The bay of the shuttle. The front of the shuttle is to our right; the back to our left. The docking hatch is roughly halfway up this photograph on the righthand side. The crew compartment and flight deck are to our right. 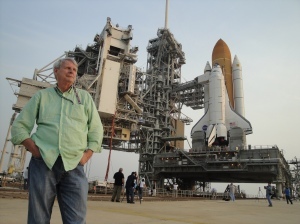 The photo is taken standing beside, not on the shuttle itself. We were invited to sign our names on the wall as we left the Shuttle Discovery. Our signatures appear in the lower right of this photo. 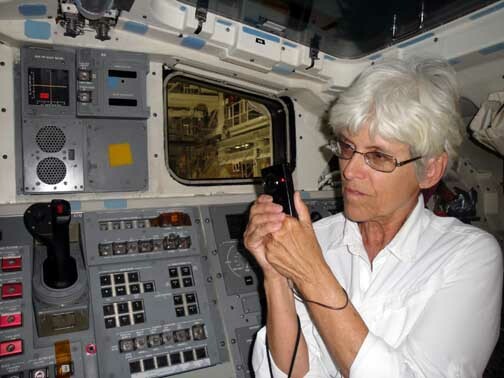 On June 21, 2011, NASA invited 85 journalists to come to Florida, visit and photograph the inside and outside of the Shuttle Discovery, the oldest survivor of the Shuttle fleet. Early next year Discovery will be taken to the Smithsonian Air and Space Museum at Dulles International Airport in Chantilly, Virginia, and placed on display. 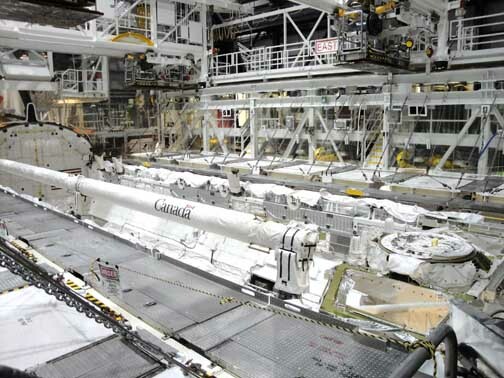 On Tuesday, June 21, the media were allowed on both decks of the Discovery, invited to crawl to the hatch which attached the Discovery to the International Space Station, and to the cargo bay. 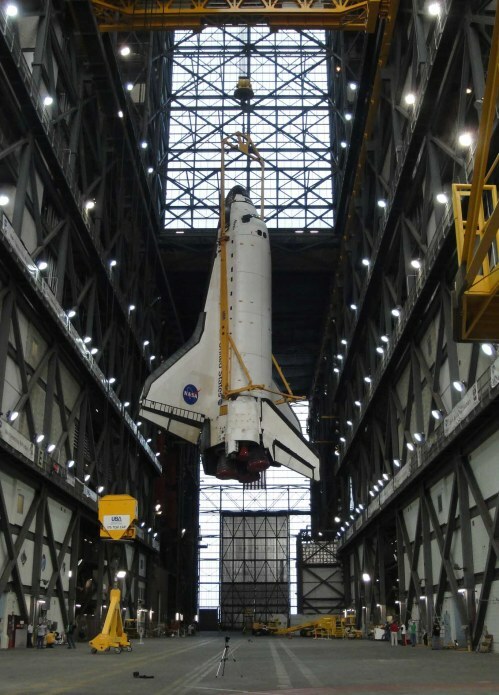 They were free to prowl outside and around the Shuttle which is in High Bay 1, Orbiter Processing Facility (OPF). 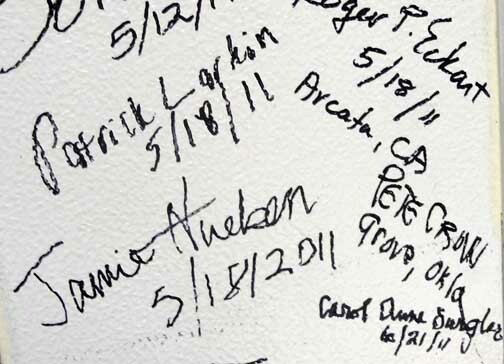 As the media were leaving the Discovery flight deck, they were invited to sign their names on the wall using a marker. The header photograph is a portion of the wall where media, and others, signed. At the Smithsonian it is believed the public will have no access to the decks of the Discovery and the signatures of the media, the workers and others who contributed to this remarkable program and who were invited to sign the wall will be visible only to Museum officials.